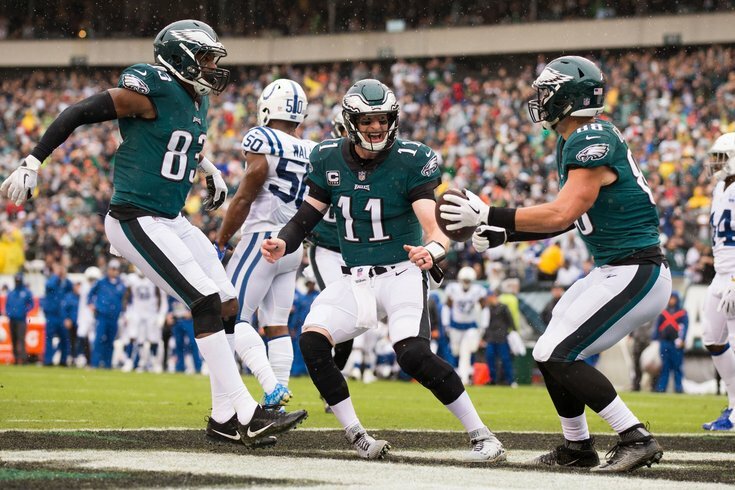 Philadelphia Eagles quarterback Carson Wentz and tight end Dallas Goedert and tight end Josh Perkins celebrate after a touchdown against the Indianapolis Colts during the first quarter at Lincoln Financial Field. Any nervousness about Carson Wentz's health at Lincoln Financial Field disappeared almost immediately on Sunday afternoon, with the franchise quarterback looking sharp and healthy almost immediately. The Eagles didn't put up a ton of points in his first half of the year, but they go into the locker room feeling good with a 10-7 lead over the Colts. Here's what I saw in the first half of play from the Birds. • If there was any question about the workload the Eagles would allow Carson Wentz to have in his first week back — on a slick field no less — they put that to bed on the very first drive. Wentz lined up with an empty backfield for a good chunk of Philadelphia's opening drive, and they let him go out and sling the rock right away. There are a lot of differences in how the offense looks under Wentz and Nick Foles, but the amount of hurry up the Eagles unleashed with their starter back out there may have been the most noticeable shift. Wentz forced the Colts to minimize substitutions by keeping the Eagles in no-huddle for most of the first drive, and they chewed up yards in no time. As if it came from a movie script, it was Wentz who got to put the finishing touches on the opening drive, looking off the safety before finding rookie Dallas Goedert over the middle for an easy score. One drive and Wentz has already turned Goedert into the red zone threat everyone thought he'd be. What can't this guy do? • Just as encouraging as Wentz's first drive was the way the big boys up front looked in the opening quarter. The Colts entered the game as the No. 1 third-down team in the league, and Jim Schwartz's defense was coming off a brutal performance against the Tampa Bay Buccanneers on the road. They came out ready to avenge that performance. The sacks didn't exactly pile up, but Philadelphia's defensive line combined to put a ton of pressure on Luck, collapsing the pocket with excellent work from Michael Bennett, Chris Long, and the rest of the cast without having to send more than the front four. Any time you can drop seven in coverage and still get to the quarterback, you're going to have a good day at the office. Wentz also showed off the wheels to pick up a first down late in the first half, and the knee is looking just fine so far. • The debutant only got limited reps in the first half, but kudos to Josh Adams making the most of his opportunity. After getting tackled for a loss on his first carry — welcome to the league, brother — Adams picked up 30+ yards on his next two carries, showing off a nice mix of burst and power. It's worth noting, though, that a lot of that can be credited to the offensive line. Jason Peters continues to absolutely maul opposing players on the left side of the line, and on one big gainer for Adams a member of the Colts secondary basically jumped out of the way to avoid the freight train. Offensive line play tends to take a backseat to the skill guys, but man is Peters a joy to watch. • If the Eagles can get Dallas Goedert going, it's going to make life so much easier for this offense with or without the skill position players currently out with injury. Philadelphia ran a decent amount of three TE personnel groups in the first half, and the combination of Goedert and Zach Ertz already looks like it can unleash a lot of damage on opponents. With as comfortable as Wentz looks running the offense, giving him more weapons is almost unfair. • The score may be close, but this feels like a game the Eagles are going to win comfortably by the time it's all said and done. The Colts struggled to move the ball for most of the half and look like the worse team by a pretty significant margin so far. • Since when does Jake Elliott miss from 50+ yards out? This is a scary new world. • Ronald Darby's coverage on Ryan Grant's touchdown in the first quarter was about as tough and tight as you can legally play. It was the defensive miscues that put the Colts in scoring range to begin with the Eagles will want back. The biggest mistake, of course, was the pass interference penalty Jalen Mills took while trailing T.Y. Hilton down the sideline on an Andrew Luck deep pass. It was a somewhat soft call — the ball was underthrown, and Mills' contact was basically inevitable as Hilton had to stop short — but add it to the list of costly mistakes Mills has made through just three weeks of play. Sidney Jones didn't drape himself in glory on that drive either. He had an opportunity to wrap up Grant and stop him short of a first down in the red zone, but he waited too long to initiate and eventually allowed Grant to fight through him for a first down. Secondary play was not great early on. • It wasn't all good from Wentz in his first half of football since last season. There were moments where he held the ball a bit too long in the pocket, and according to the beat writers on the ground at the Linc, there were a couple targets Wentz missed on a third-down play midway through the second quarter. That's the first sign of rust or lack of sharpness we've really seen from Wentz. Aiken was wide open for the short first down right in front of him and he pretty much threw the ball away. Wentz had Clement WIDE OPEN early on that play. Didn't see it. But look, it's his first week back and he deserves a bit of slack. Not going to see and make every throw. • Chris Long has been a productive Eagle, but hoo boy did he look bad letting Luck run right past him for a 33-yard gain. • Did we actually get through a half without me having to complain about the officials? The return of Wentz must have made everyone step their game up.